Name, age, hometown: Alex Breitzke ("Sharkbait" to my Pioneer corps friends), 14, Valparaiso, Ind. What corps are you in and what is your role this summer? This is my third season marching in the Pioneer soprano line. Where I go to school and what I'm studying: I am a freshman at Valparaiso High School in Northwest Indiana, working toward an academic honors diploma. Give us your full drum corps/marching music background. My high school has always had championship concert bands, but we do limited marching. So, my primary marching experience is with Pioneer. What's your personal practice schedule like: I try to practice at least an hour every day. What does your ideal free day consist of? For me, an ideal free day would be spent in a place where there is lots to do and I can hang out with my friends. Favorite pig-out food: My favorite pig-out foods are Fastbreak bars, Combos pretzel snacks and Powerade drinks. In the shower you can hear me singing: I cannot sing, so I never sing, not even in the shower. The last good book I read: The last good book I read was "Digital Fortress: A Thriller" by Dan Brown. The last great film I saw: It's been a while since I went to a great movie. Jobs I have/have had: I haven't had a job yet because I am below the minimum age requirement of most places. My favorite TV show: My favorite TV shows are "CSI: Crime Scene Investigation," "Numbers" and "Las Vegas." What has been your formative drum corps moment? It was right after I had marched my very first show. Standing on the field when we finished our show, I felt a great sense of accomplishment, knowing that I was able to march and play the show. Seeing the people in the stands and hearing them cheer for us was exciting. What would you be doing next summer if you were not marching? I would probably be taking summer school classes and playing soccer. How did you decide to be a member of your corps? I chose to join Pioneer because of the great friendly environment that one has in Pioneer. No one was concerned about my age. The staff and the corps members treated me with respect. They expected the same from me as from everyone else in Pioneer. My thanks to Mike Boo for introducing me to the people at Pioneer and to the staff and members of Pioneer for giving me a chance. What first attracted you to the drum corps activity? 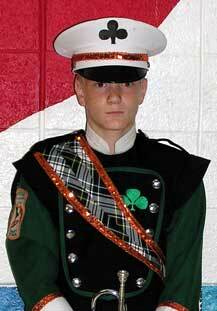 I saw my first drum corps show when I was 11. What I didn't know was that I would be marching with Pioneer the next summer. I thought its music was just so cool and I really liked how the corps used the drill to express the music. I started playing trumpet when I was 6 and had reached a stage where I was looking for new challenges in music. What advice would you give to young people who want to march? Don't be afraid to pursue your goals. As long as you have determination to reach your goal, you can succeed. What I want to be when I "grow up": I have not quite decided what I want to do as a job, but it will most likely be in the fields of science and engineering. Best drum corps show ever and why: My favorite drum corps show ever would have to be 1992 Velvet Knights. The show had so much humor in it -- the dancing Godzilla, the huge shark eating the singing fat lady. The music and drill were just so great. VK executed it well and the audience loved it. The year is 2030. What does a DCI show look like? In 2030, I see a DCI show as having more creative use of electronics in a show, like having light effects for a show. The marching drill for shows will be more complex and amazing.